We provide a full spectrum of solutions to engineer a lasting partnership with our customers by maximizing your RF capability and readiness. 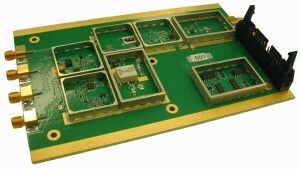 NuWaves designed, developed, prototyped, and produced an initial quantity of a high-performance, miniature transceivers with full-duplex, bi-directional operational capability across L-, S-, and C-Bands. This module supported operation in transmit or receive only mode to allow for a unidirectional link. 24-month design and development of a micro-transmitter supporting CFTM. u-Transmitter supports continuous transmission at 2 to 5 watts.